A womenâ€™s figure skating performance that likely will be remembered as one of the best of all time. The South Korean soared to the Olympic gold medal Thursday night, scoring 228.56 points and shattering her previous world record by more than 18 points. It is South Koreaâ€™s first medal at the Winter Olympics in a sport other than speedskating, and itâ€™s sure to set off wild celebrations from Seoul to Pyeongchang. The 19-year-old grinned as she hopped up to the top spot on the podium, tugging at the bottom of her dress. When the gold medal was slipped over her head, she kissed both sides and held it up. Her lip quivered when the South Korean anthem began, and then came the tears. She made a beeline for someone holding the South Korean flag as she set off on her victory lap, and carried it triumphantly as fans serenaded her with cheers and applause. â€œTruly I still canâ€™t believe that I did what I wanted to do at the Olympics,â€ she said. 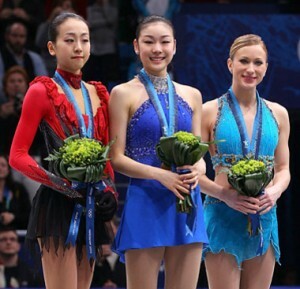 Longtime rival Mao Asada of Japan won the silver medal, but it was no contestâ€”even with Asada landing both her triple axels, one in combination with a double toe loop. Asada was more than 23 points behind Kim, a margin so big Kim could have done nothing but figure 8s for the last half of her program and still finished in front. That is exaggerating just a tad. Asada is very talented but Kim’s juggernaut like run to the Gold medal was seen as inevitable by most knowledgeable people for at least two years. This blog rarely features posts about figure skating, but I also wrote about Kim beginning with this post. I learned about her in late 2008 and it gave me an idea for one of my online fiction stories. The United States was locked out of the medals for the first time since 1964. (Which was a special case. The entire U.S. figure skating team was killed three years earlier in a plane crash) Again people who followed this sport the American skaters would need a miracle to just earn a bronze medal. It didn’t happen. A big thank you to GI at ROK Drop. I used the links and photos from his post.